Socks are usually the last thing most people think about when putting together an outfit, and they’re something you’d hardly think of it you want to send across a message. You know, with them being on the feet, away from our eyes and all. But… slowly, but surely, the trend of having cool and funky socks is picking up worldwide and its pretty cool. I mean, why didn’t we think of socks like this before? For the people behind Halal Socks, socks represent something very powerful and they’re using them as agents of change. Halal Socks is a company that aims to build a brand for the ‘modern Muslim’, a brand that encapsulates their values and their beliefs. Halal Socks stands for being inclusive, and more importantly raising awareness about what Muslims really believe in, By doing so they hope to dispel the image of Islam and Muslims people generally have world over. The ‘Eid Mubarak’ socks made everyone go ‘awww’ (well most things he does has that effect on people) and it gave this company possibly their biggest buzz. Halal Socks, which started in May 2017, is a Toronto-based company that produces the now famous pair the ‘Eid Mubarak’ sock. Their designs are just too colorful and festive not to fall in love with. 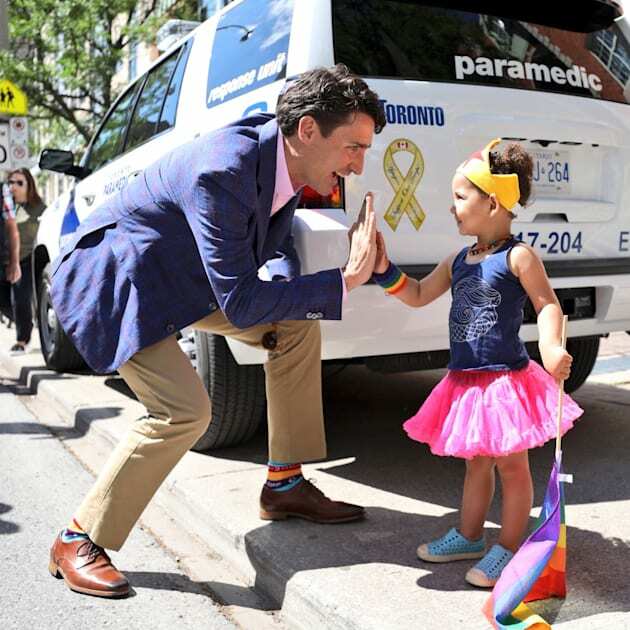 And Justin Trudeau’s love for their socks definitely catapulted them into worldwide fame. They hope their brand becomes a symbol of Islamic lifestyle and also of ‘Muslim pride’. Their ‘Unity Collection’ is where the now world famous ‘Eid Mubarak’ socks are from. ‘Beard Bros’ is a design from that collection that gels well into modern Muslim life. And also adds a little fun and color to an outfit, thereby helping to remove the negative stereotype against bearded men. The company makes socks that relate to some of the most iconic traditions, festivals and events in the Muslim world and their socks really are Halal. Halal Socks is doing some pretty cool stuff with socks. This type of creative thinking and out of the box innovation is needed to help remove the stigma against the Muslim community worldwide. They aim to do this by donating 5% of all their sales to charities that align their their values and aims. If you want to check out the rest of their collection, or maybe even shop, you can do so here.